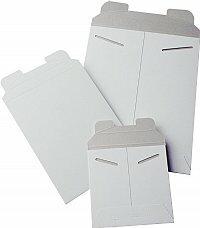 Rigid white mailers perfect for shipping and storing documents, photos, diplomas, artwork, maps or other flat items. Will not crush or bend. Made from recycled white clay-coated news back with a semi-gloss white surface. Lightweight (to save on postage) but very sturdy. 6" x 8" - ON SALE! 9" x 11-1/2"- ON SALE! 9-3/4" x 12-1/4"- ON SALE! 11" x 13-1/2"- ON SALE!